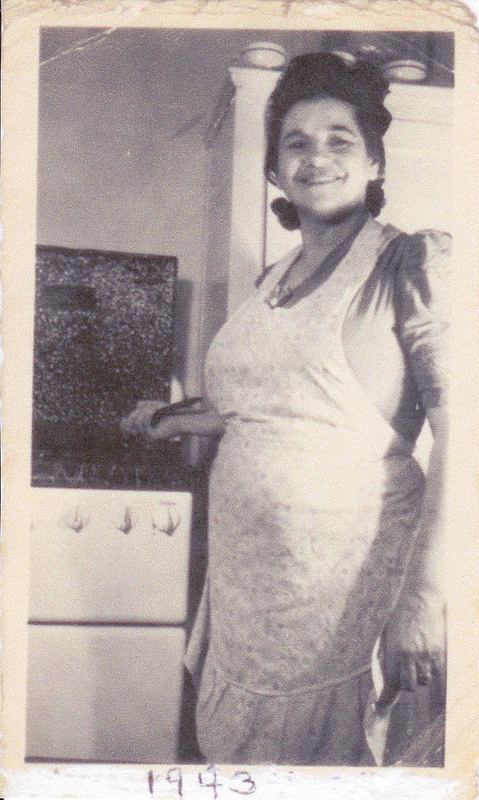 From earliest childhood, I remember my bubbe Bessie’s tremulous voice as she sang Yiddish lullabies. The words, faintly heard, were upstaged by rapturous melodies. She was otherwise a fixture in a small kitchen, preparing chicken soup with luction (noodles); kneading dough for Shabbat challah; chopping fresh carp to make gefilte fish cakes, and throwing together a bowl of komput. (stewed fruit) Sponge cake followed as last on the list of savory offerings that filled us to the gills before we wound our corpulent selves down the staircase of her South Bronx tenement. A shule bordered the apartment and provided a parted-curtains view of Chasidism (Orthodox Jews) davenning. (Bending forward and back in solemn prayer) Bubbe would scold me for my voyeurism because it was a violation of the Almighty. She would pay dearly for it in the next life.. if there was one. Like Molly Goldberg of TV fame, she would message her neighbors through the window, across clothes lines and homing pigeons that came and went. Everyone and every thing managed to communicate what they needed in one form or another. Apparently, bubbe was a woman of many talents. Her fame spread far and wide as the neighorhood’s matchmaker or “shadkhin” after she tried to pair a stutterer with a hard-of-hearing woman. The way my father re-enacted the whole scene, it was worth a Comedy Central feature. Visitors frequented my grandmother’s dim lit flat on Longfellow Avenue. Mrs. Lox, the upstairs neighbor, sometimes knocked on the door to get a little attention. She barely sauntered in with legs so full of edema you wondered how she managed her life. A gulp of gossip filled a half-hour of conversation before my zayde (grandfather) came home from the railroad yards where he toiled as a freight man. Nick-named “Pineball” because of his shiny bald head and stocky frame, he would sometimes deposit a “live” fish in the bath tub. The first time I saw one I had to wipe my eyes making sure a real angler was beside me. I was otherwise preoccupied, pulling a chain to flush the toilet. Years later I learned that bubbe prepared the catch for dinner so it went to good use. Invariably, she always intoned prayers in a white satin shawl while zayde cursed under his breath, denying the existence of God. Nothing was ever resolved at mealtime and life went on. After encore desserts, tea, and more sponge cake, songs followed which were memorable. My favorites are revisited. “Shlof Mayn Kind,” (Sleep My Child) is at the top of my memory archive. Like so many of these songs embedded in the minor mode, they reflected a people’s suffering over centuries. The music naturally flowed through the veins of our Jewish forebears preserved by those who memorialized them in well-researched collections. 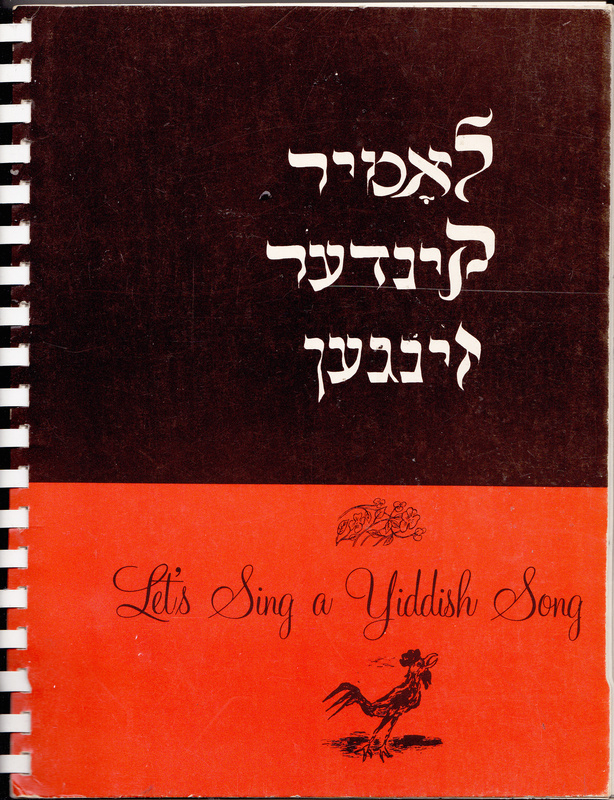 Ruth Rubin, one of these archivists, published Let’s Sing a Yiddish Song that contained two selections that I chose to play and sing. Ves-tu vi-sn an un-ter shid. There’s something you will come to know. 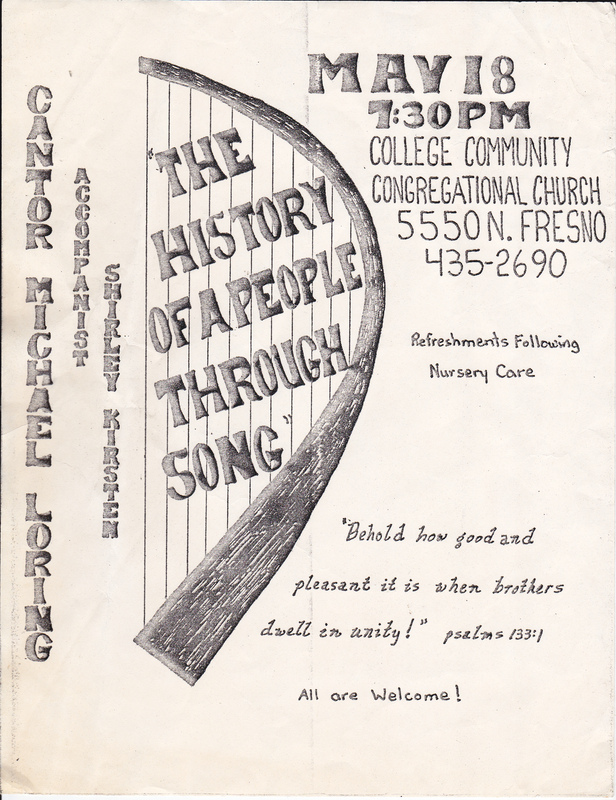 These songs evoked poignant memories of my first musical appearance in Fresno when I accompanied the late, Cantor Michael Loring in a concert of Jewish Liturgical Music. We presented “The History of a People Through Song” at the College Community Congregational Church, known for its yearly offering of the St. Matthew Passion. Its musical director, John Donaldson, a member of the Board of Supervisors, always programmed fine, classical music throughout the year. Our ecumenical convergence took place in an acoustically divine space that held a modest, old upright. The instrument soared like a grand, belying its size. An echo chamber would have best described the setting. 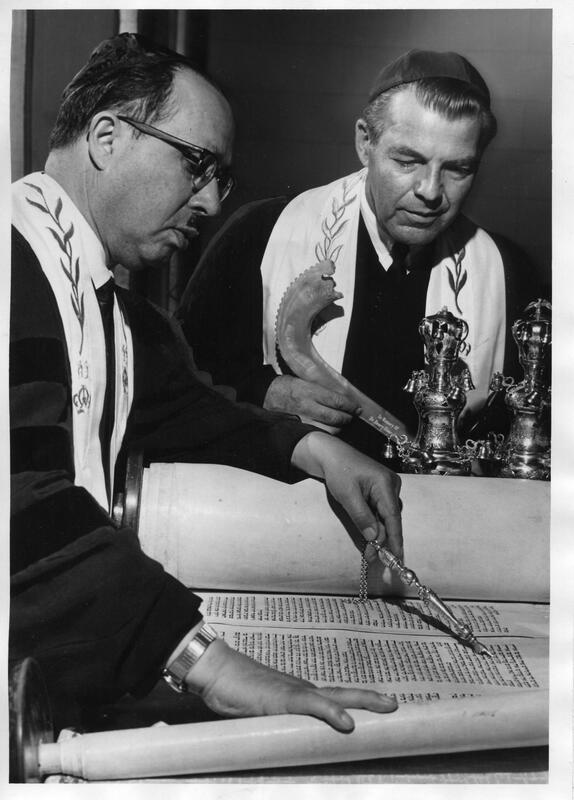 Here’s a photo of Cantor Loring, to the Right, beside Rabbi David Greenberg at our local Temple Beth Israel. The icing on the cake, was my father’s appearance in Fresno on the stage of Temple Beth Jacob. We, two collaborated on selections from Fiddler on the Roof. While such a Broadway spectacular may have been a bit removed from the original Yiddish traditional folklore passed down by our ancestors, it still revisited the shtetl where it all started. Next postIrina Morozova, pianist, shines playing Gershwin Virtuoso Transcriptions on CD! Shirley, I just e-mailed a letter to you through Seymour . I mentioned that i wanted to check out some of your Jewish blog information and on came Shlof meyn Kind and Ofn Pripichek. My memory went wild .THis was my life for 60 years mostly in Brooklyn at a classically rReform congregation. Idid Jewish cantatas.THank you for reminding me of those beautiful tears. The Temple is gone but the music and memories are forever.